According to ID (Information Display) magazine, published by SID (Society for Information Display), a huge challenge in display technology has been a manufacturable pixel-switch backplane that can drive OLED pixels with economy, stability, and long life. Samsung, and now others, solved that problem with low temperature polysilicon (LTPS) for small and medium-sized displays. However, the LTPS process is difficult to scale to large sizes, in addition to having issues of material waste and acceptable but less than ideal uniformity. LG uses an amorphous metal-oxide backplane, which has had yield and stability problems when used with OLEDs. “The ideal would be using single crystal silicon for the backplane, if anybody can figure out how to do it technically and economically (p. 20, ID, September/October, 2016, Vol.32, No.5).” ST is pleased to announce that it not only has the technology to achieve this economically, but it also has an issued patent for it. (Available as a PDF through this link). Sapphire glass, or single crystalline Al203, is an ideal substrate on which to deposit many materials for device applications such as solar cells and LEDS. It is also highly attractive for display covers due to its hardness. Solar-Tectic plans to produce sapphire glass consisting of a layer of highly oriented or single crystalline Al203 sapphire on quartz and ordinary soda-lime glass. This combination of hardness and oriented crystals distinguishes it from other glasses on the market such as Gorilla glass, which are amorphous or have no crystallinity. Gorilla glass cannot be used for epitaxy for example. ST sapphire glass offers a much cheaper alternative to the sapphire glass currently available on the market and used for example for LEDs while preserving the desirable traits of hardness and grain texture (orientation). Such a glass would also be light weight in comparison to the sapphire glass currently on the market since it would have a very thin film of sapphire and the bulk of it would be quartz or soda-lime glass. Solar-Tectic plans to grow GaN on its highly textured  sapphire glass for LED applications. Additionally, ST has recently been granted a patent for OLED technology involving hybrid organic/inorganic thin-films on glass (for details see “News”) which can also be applied to ST sapphire glass. 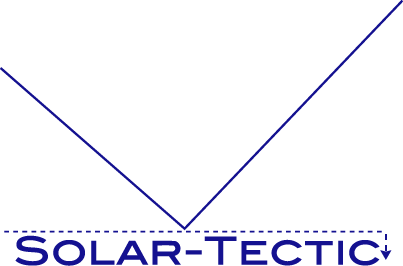 Update (June 28th, 2018): Solar-Tectic is pleased to have made the first ever highly crystalline,  oriented, insulator thin-film for TFTs. Raman and SEM show that it provides a crystalline template for better quality LTPS polycrystalline silicon film growth. The same may apply to a-Si:H film for LCD TFTs used in displays. It is the first crystalline insulator film with (111) orientation ever made. The (111) orientation, or c-axis aligned film, matches with silicon’s preferred (111) orientation. The c-axis alignment may also be beneficial for IGZO growth, which has also been demonstrated with c-axis alignment (called CAAC). In all in all, this material promises to be a very simple way to improve TFT performance for all kinds of displays by increasing the semiconductor mobility. MgO also has a higher melting temperature than SiO2 and SiNx. A paper was published, and a patent issue for this technology.